The Expert Gallery serves as an intuitive interface between your faculty and visitors. Showcasing faculty by their expertise through the Expert Gallery serves as a starting point to collaboration with colleagues and students, both within and outside your institution. Membership badges are a natural extension of these connections. The Media Contact, Collaborator, and Mentor badges link directly to your Expert Gallery, and allow visitors to identify those open to potential opportunities. The Contact button integrates naturally, providing the medium to foster these partnerships. Visit our blog to see how these features benefit our clients! Managing these features begins with your Administrative Interface. Starting on the Profiles tab, you can select which profiles will serve as Media Contact, Collaborator, and/or Mentor. Simply check the box under the appropriate membership column(s) to enable corresponding badges and contact options for each profile. The Contact button, which appears under the profile picture, is already enabled by default. Membership Badges are link enabled and direct visitors to your Expert Gallery. 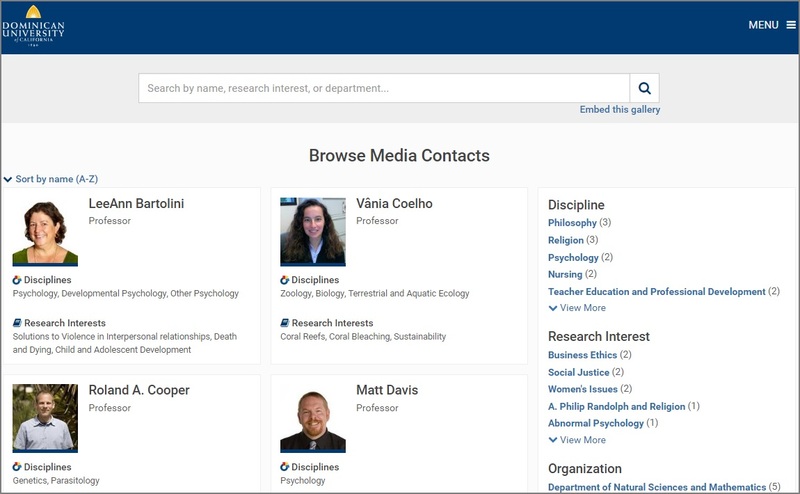 For example, if a profile is marked Media Contact, clicking on this badge directs visitors to a special Browse Media Contacts page so they can to view the profiles of other collaborators at your institution. Visitors can then explore other areas of your Expert Gallery, including facet types such as Discipline, Research Interest, Organization, and Position. 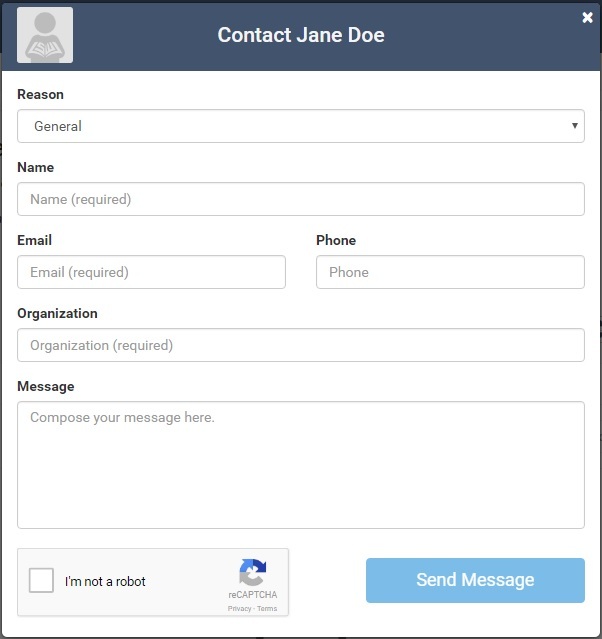 When visitors click on the Contact button to send a message (from either the main profile page or above the individual works pages), they are prompted to fill out a form that includes the following fields: Reason, Name (required), Email (required), Phone, Organization (required), and Message. To help ensure no spam for recipients, reCAPTCHA is provided. While General is the default Reason on the contact form, if one or more badges is enabled for the profile, these options will also appear. For example, if a profile is marked as a Collaborator and Mentor, visitors can choose between General, Collaborator, and Mentor as a reason for contact. Once a visitor submits a contact form, only the recipients designated in the Contact Groups section of your Settings tab will receive notification. On the Settings tab, under the Contact Groups section, you identify who will receive any of the messages generated from profile Contact button. Customize recipients based on badge type and even general inquiries. For example, for profiles marked as Media Contact, direct visitor messages to your Media Relations Office. Collaborator? Faculty Research Office. Mentor? Student Development Office. If you wish profile authors also receive correspondence, check the box under the CC Profile Owner? column. Once you add a recipient’s email address, it will show as (pending). The recipient will receive an email with the subject “Confirm your subscription to Expert Gallery media inquiry e-mails”, and must click on the link to accept and confirm in order to receive messages. Additional confirmation emails will be sent (and must be confirmed) if the recipient is added to more than one contact group.